Italian Mountain troops Colonel visor cap. 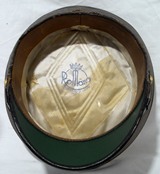 Visor cap, pattern '40, for Colonel of the 1st Alpini Regiment. The regiment's saying was: "Nec nec descendere morari" and, during WW.2, was part of the Cuneense Division operating on the Russian front. Inside there is a manufacturer's mark: the hatter "Romano-luxury cap". On the top there are few small moth's holes, and use signs on the round bottom. Size 58. Overall the visor cap is in good condition, and it's rare for the rank and type. Notify me of updates to Italian Mountain troops Colonel visor cap.